This 802.11p tutorial covers 802.11p features, frequency spectrum, 802.11p protocol stack covering physical layer and mac layer. 802.11p is also known as WAVE or DSRC. Introduction: It has been developed as amendment to IEEE 802.11 standard specifications in order to support ad-hoc communication between vehicles and between vehicle and infrastructure network. There are changes made to PHY (Physical) and MAC layers for the same. IEEE 802.11p is also known by names such as WAVE (Wireless Access for Vehicular Environments) and DSRC (Dedicated Short Range Communication ). The main objective of 802.11p compliant devices is to improve traffic efficiency and have safety in the traffic flow (i.e. to prevent accidents). The network formed by 802.11p compliant devices is known as VANET. FCC has allocated spectrum having 75 MHz bandwidth from 5850 to 5925 MHz for vehicle to vehicle and vehicle to infrastructure communication as shown in the figure-1. Following are the features of IEEE 802.11p WAVE devices. Following are the changes made to Physical layer of 11a in IEEE 802.11p. • Supports bandwidth of 10 MHz instead of 20MHz used in 802.11a. • It has same modulation schemes such as BPSK/QPSK/16QAM/64QAM. • The number of data carriers are 52 in a symbol, which is same as 802.11a. • The symbol duration has become double compare to 11a. IEEE 802.11p supports 8µs while 11a supports 4µs. • Guard time interval is 1.6µs in 802.11p while 11a has 0.8µs. 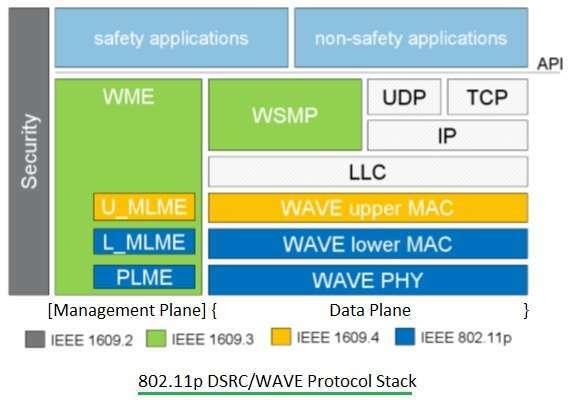 The figure-2 depicts entire DSRC/WAVE protocol stack. AS shown it consists of IEEE 1609 standard and IEEE 802.11p standard. 802.11p standard defines PHY and MAC layers while upper layers are defined by IEEE1609. The layers are divided into management plane and data plane. Management plane consists of WME (WAVE Management Entity), MLME (MAC layer Management Entity), PLME (Physical Layer Management Entity). Data plane consists of WSMP, TCP, UDP, IPV6, LLC, MAC and PHY layers. ➨IEEE 1609-2 defines security services for application messages and management messages in WAVE. ➨IEEE 1609-3 defines connection set up and management of WAVE compliant devices. ➨IEEE 1609-4 sits on top of 802.11p layers. It enables upper layer operational aspects across multiple channels without knowledge of Physical layer parameters. ➨IEEE 802.11p PHY layer takes care of modulation/demodulation, error correction technique etc. Physical layer has been changed. It supports 10 MHz bandwidth, improved performance in WAVE compliant receiver and improvement in the power transmission mask. ➨IEEE 802.11p MAC layer takes care of messages to establish and maintain connection in harse vehicular environment. It also defines signaling techniques and interface functions. Stations communicate directly without need to communicate or join with BSS in 802.11p. The frame structure, Physical layer modules and MAC layer messages in 802.11p are similar to IEEE 802.11a. Refer 802.11a PHY➤ 802.11a Frame structure➤ WLAN MAC frame types➤.